I tried posting this in the main Power Designs Power Supply thread and didn't get a response, so I thought I'd have better luck here. I'm a relative novice. I've purchased some used test equipment to set up a learning lab, with the assumption that any broken equipment I end up with will be a learning opportunity. The circa 1996 Power Designs TP340A I got seems to fit in the learning opportunity category. When I received it, before powering it up, I opened it up and checked it for obvious component failures. 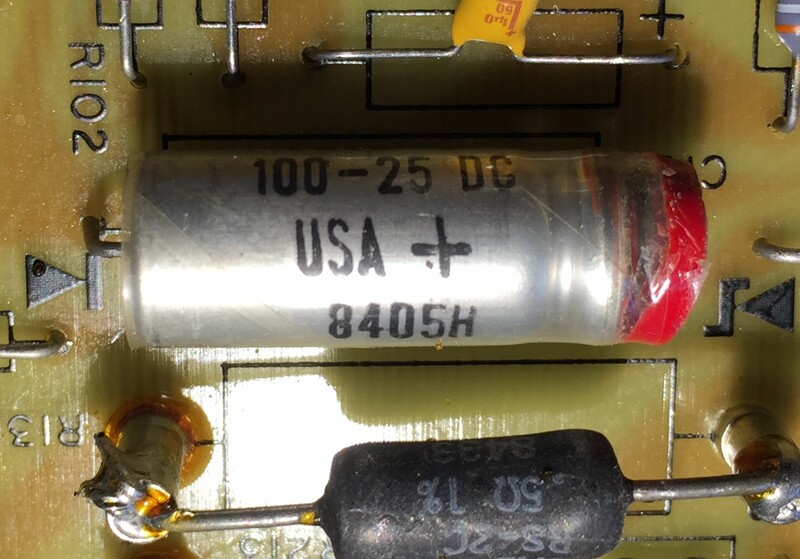 I found one, a sprague capacitor with a deteriorated rubber seal that pushed out its epoxy(?) seal. I know from the users manual and googling that they are 100uF 25v polarized DC caps. I find plenty meeting that general description on digkey, etc, but don't really know what else to look for besides operating temp range and rated life, and I haven't been able to figure out those specs for the original parts. Is there anything else I should consider in picking replacements? I'm also planning on replacing the large electrolytic, but the choices seem a little more obvious there. I also plan to recap my circa 1988 5020 Precision Power Supply. It has a number of caps that the datasheet describes as "tantalytic." Are these worth proactive replacement as well? Just out of curiosity, is this a 2005 or a TP340A? FWIW, I doubt it's all that critical (doesn't appear to be part of the ovenized circuit in a 2005 to me at any rate). I've purchased some used test equipment to set up a learning lab, with the assumption that any broken equipment I end up with will be a learning opportunity. The circa 1996 Power Designs TP340A I got seems to fit in the learning opportunity category. I know they were around in the '60's & '70's (design style of the front panels matches up to this IMHO), but I seem to recall they died well before 1996 (replacement part from a repair perhaps ). Registered in CA in 1952 (source), and trademark "PD" filed for in NY in 1964 (source). Resigned in 1991, but it's not active, nor is there anything after that. The original 2005 was designed in 1964. TP340 & TP343A (same manual), is from 1983. TP340A & TP343B (same manual), appears to be from 1988 to my eyes, as the scans aren't that clear. But they seemed to have been consistent with a 5 year update/redesign cycle, so the timeframe fits. Don't think they made it much past 1988 before they failed though, given it's registered agent resigned in 1991, and no filings were ever made after that. Trademarked PD expired in 2008, and wasn't renewed either (unlikely for a dissolved company). Sad IMHO, as they're nice PSU's. BTW, if you've a 2005, Power Designs model 2005 precision dc power source might be of interest. Nichicon VX series (TVX1E101MAD) should do, as they're just general purpose axial aluminum electrolytic capacitors. And they're only $0.86 in singles. If you want to go nutz, a Vishay 118AHT series might be of interest (MAL211836101E3). Longer lifespan, but at ~4x the cost (rated for 4000hrs @ 125C; usable lifespan @ 40C is 500k hrs). Downside, is they cost $3.47 each in singles. Unless there's visible evidence of leakage or scorching, I'd leave those alone (not necessary). I'm starting with the TP340A. The non-functional 2005a is a project for another day. It's of less utility to me since I have a working 5020 Precision Power Source, whereas I could use a general purpose triple-output bench PSU. Plus, I'm still negotiating with the seller for a discount due to it not working. My basis for the '96 date estimate is that I spotted a number of date-codes from 94-96 on components here on the pictured board. I didn't spot obvious signs of repair, but it is certainly possible. It would explain why one of the op-amps is labeled Ti and the other NatSemi. For what it is worth, the meters are all stamped with what look like '96 date codes too. It appears that they managed to release another generation of equipment after this one. In doing so, they dropped the classic mid-60s design that served them for years and adopted a plastic enclosure. Unfortunately, the available PDF of the user manual doesn't have any dates. I noticed though that their corporate address was listed as CT, rather than NY. As long as your having to buy a new cap to replace the blown one, I would definitely recommend getting a "105 C" rated one. This will be a more durable and reliable unit than the standard 85 C caps. Along the same lines, I might go for one rated at a higher voltage. If it were me, I'd also try and get one about the same physical dimensions as the one you're replacing. That 100uF 25V capacitor looks like a Sprague capacitor. Does it have another number, such as 500D? As close together as the mounting holes look, I'd measure the distance between them, and pick a replacement accordingly. If the 118 series would fit, that's what I'd use. If I couldn't find a 118, I'd then check for a 138 series. Also, tantalytic is basically tantalum and electrolytic ran together (about all tantalum capacitors are electrolytic). They are highly reliable, but do sometimes fail. They could be tested in-circuit with a good meter. I'd use an LCR meter on them all (preferably one with at least parallel mode or both series and parallel modes). I would not recommend a DMM with a capacitance function to make in-circuit measurement's, unless it used a bridge (and I don't know of any that do). (It's been my experience that using an LCR meter to measure electrolytics in-circuit works OK, although dissipation usually reads high and parallel capacitors would need removed for individual readings). "Sprague, 5000, 100-25 DC, USA, 8405H." It's definitely a 500D series then, as there is no 5000 series (Vishay owns Sprague). Current replacement P/N is 500D107M025CC2A. Not available from digikey (all I searched last time). It's rated at 2000hrs @ 85C, with physical dimensions of 8.0mm x 20.5mm (Nichicon & Vishay 118AHT are 6.3mm x 17 & 6.5mm x 18mm respectively). At $3.26 in singles, it's on the expensive side for a general purpose part. If you don't mind the cost of the 500D series, you'd be better off with the Vishay 118AHT series for the improved temperature and reliability ratings IMHO. There shouldn't be that many of them, so that would help keep the parts cost under control (digikey offers reduced pricing at $28.76 for 10 pieces; you have to hit 50 pieces + with Mouser before any discount pricing kicks in for the 500D series part). If you'd rather save on funds, but still get it operational, the Nichicon will certainly work and have decent reliability (far from garbage, and it has the same reliability rating as the 500D series; 2000hrs @ 85C). FWIW even though it's sitting next to that TO-3 bipolar, I don't think it's getting all that hot (no heat sink on it, and not seeing any signs of scorching on the board around it or the large power resistor on the other side of it). Thanks for the added info. I'd been eying those 118AHTs as an option before seeking council. There are only 3 of them, one per output, so I'll probably go ahead and get the higher rated parts. The schematics I have are unreadable, but it doesn't seem like that power transistor is going to generate much heat. The major output transistors are either mounted on a big plate on the chassis or a big outrigger heatsink on the back. The higher-current channel also has one mounted on a PCB with a heatsink. On the topic of the age of the unit. I checked more date codes when I had it opened up, and all the power transistors, and every other date code I could spot was from '96. with the exception of the NatSemi amp IC on the third channel, which was also from '94. So, it seems that they were still building these into the 90's. As I recall someone said that they were acquired at some point, so the products/brand may have lived a while after the corporate entity disappeared. Next step, putting together an order of all the caps I'll need for my various refurbishment projects. So, I've changed the name of this thread, because this thing needs more work than just recapping. The recapping itself didn't go entirely smoothly. I put two of them in backwards and caused them to vent. After remedying that, things mostly worked, but a few things weren't quite right. In the process of running that down, I noticed that some of the control voltages were out of spec. In looking into that, I pulled the main-temperature compensated 1N825 zener for Source B and burned it out while testing it. I ended up replacing it with a NOS Motorola 1N827 temperature compensated Zener I got from eBay. Then I discovered that what was also supposed to be a 6.2v temp-compensated 1N825 zener in the analogous position in source C was actually a 5.6v Zener, so I replaced that with an 1N827 too, and did the same in Source A. Another zener in Source B was bad too, so I replaced it. I'm wondering if my mistake with the caps could explain some of the bad zeners, but it obviously doesn't explain why the wrong zener was used in Source C. If it was a botched repair, they at least did a nice job soldering it in. With those parts replaced, all the control voltages are now in spec, but there is another problem. Source B has bouts of major instability, wandering over a range of nearly 1V over the course of minutes. It's happened more than once, but I haven't figured out how to reproduce the behavior reliably. Even when it seems stable, its not right. It's load regulation is an order of magnitude worse than that of its twin, Source A. Also, when I used a fixed resistive load and monitored the output voltage on Source A and B over a few hours, the Std Dev of voltage on Source B was >10x larger than Source A.
I haven't figured out what to check next, but any suggestions are welcome. And a blog post with lots of pictures and some added details of what I've done so far. Nanofrog suggested looking for issues caused by thermal changes, which makes a lot of sense, so, that's what I'll be looking into next. I spent the better part of my 4th of July with a screwdriver, hairdryer and cold spray, torturing the PCB and managed to reproduce the fault and, I think, isolate it to the vicinity of a few components involved in the voltage regulation feedback loop. I inspected the PCB looking for obvious bad joints, didn't find any, but touched up some of the likely suspects with flux and a soldering iron. I tortured it again for an hour or so and couldn't provoke the problem behavior. The next morning, I tried some more, left it for a while, and then recalibrate it. It's been working well ever since, except for one issue. The overvoltage crowbar on source 2 triggered prematurely a couple of times in quick succession one day. I plan to give it a closer look, at some point, but it hasn't reared its head again in the few months since. I also found some replacement knobs on ebay, which I recently installed. They have a better look and feel than the plastic knobs the supply came with. I told bitseeker about them, and he's used them on his own TP340a supply. I think the diameter is a bit too large though, but they'll have to do. The same seller has some smaller diameter knobs that would probably look better, but they are drilled for a smaller-diameter shaft. I thought about getting them and drilling them out, but decided that I don't have the right combination of tools or skills for that to be a suitably straightforward project. Good to hear about your progress, eas. Yeah, the aluminum knobs would look better if they were a couple of millimeters smaller in diameter than the flange. But, they're still better looking than those too-small plastic knobs. It appears that your positive and negative binding posts are the same style. Mine are a combination where the positive ones are like yours and the negative ones are the older, hex-ridge style. It's as though by this period of PD's history, they were using whatever parts were available. I have one of these. It had a blown output on B I think. Really nice supplies.